The Samsung Galaxy S10 series is expected to flaunt an attractive design with a variety of innovative characteristics. Now, the Samsung Galaxy S10 is supposed to have been leaked into a live image, showing an elongated pill-shaped display hole that leads us to believe that the Samsung Galaxy S10 + is leaked. It also appears that the ultrasonic fingerprint sensor of the upcoming flagship may not work if a screen protector is applied. An image alleged to be that of the Samsung Galaxy S10 was courtesy of a person named' hissick27' on Reddit. 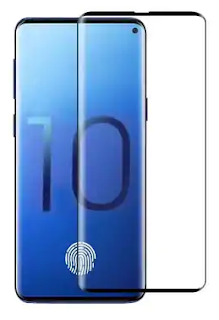 The leaked image shows the front panel of the Galaxy S10 with minimal bezels and a pill-shaped hole on the top to accommodate the sensors, a design that we have seen in the leaked renders of the next smartphones before. Although the image has been described as the Galaxy S10, we suspect that the smartphone is the Galaxy S10 + model because the Galaxy S10 + is rumored to be equipped with dual front cameras.